How can we get clinicians more involved in the battle against prescription drug abuse? The National Institute on Drug Abuse (NIDA) is using e-Tools to enlist physicians, medical interns and residents, nurses, and other clinicians in addressing this complex and growing public health problem. Prescription opioid analgesics are an indispensable treatment option for many patients in pain. Yet these powerful drugs also hold the potential for abuse (nonmedical use), escalation to addiction, and even unintentional overdose deaths. Rising numbers of opioid prescriptions over the past two decades have facilitated their diversion and misuse and led to the epidemic of fatal opioid overdoses, which in only the past few years has plateaued at around 16,000 deaths per year. -----NIDA Director Nora Volkow, M.D. Since 2009, NIDA has provided an array of materials to help physicians and other clinicians safely prescribe opioid medications for pain relief. But NIDA wanted to make these materials even more accessible by turning them into self-guided, web-based education modules that offered the added incentive of continuing medical education (CME) credits. 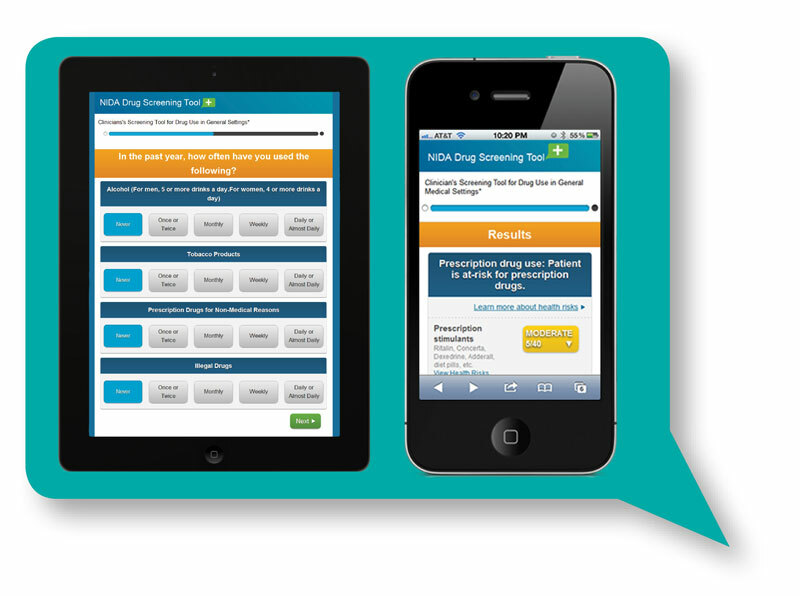 As a trusted collaborator since 1998, IQ Solutions previously helped NIDA develop an interactive substance abuse screening tool for clinicians (NM-ASSIST). We now proposed and facilitated a partnership with MedScape to create two CME courses—one to help clinicians screen patients for the risk of abuse before prescribing pain medications and another to help identify and manage pain patients who abuse their medications. We first conducted research to ensure that we met clinicians’ needs. Findings from an environmental scan, review of current data on the target audience’s demographics and learning behaviors, focus groups, and in-depth interviews guided our approach. Using NIDA science and materials, Medscape authors wrote the modules in their proven “Test-and-Teach” format, which includes scripts for companion videos that model effective doctor-patient communication and use of the NM-ASSIST digital assessment tool. NIDA scientists reviewed and edited all text. Within one year, we launched the modules in two formats: CME/CE accredited versions, which resided on the Medscape website and were accessible via NIDA’s website, and unaccredited versions, which reside on NIDA’s website. In the second year, we expanded access to accredited modules through Medscape's mobile application so that physicians might take the course through the types of handheld devices they commonly use. Our email marketing campaign targeting outreach to professional groups, medical schools, and bloggers went a long way to promote the e-Tools. Some 19 organizations agreed to promote the CME among their members through 16 earned spots and 3 paid ads in a variety of media. The project was selected for presentation at two major conferences: in an oral plenary at the American Public Health Association Annual Meeting and Conference and in a poster format at the National Conference on Health Communication, Marketing, and Media. By the end of second year, the project had exceeded all of NIDA’s goals for engagement with the e-Tools. The modules reached 39,839 physicians, far exceeding an original target audience goal of 5,000 practicing physicians. The e-Tools also engaged more than 46,000 nurses, a clinical audience that had not been included in the original scope of work. Both modules were integrated into the curricula at three, rather than just two, U.S. medical schools: the University of Florida, the University of Utah, and the University of Washington. Nearly 600 learners completed the unaccredited modules as part of their medical school curriculum, exceeding an original goal of 200 medical students. The NIDA e-Tools project also was recognized with the NIH Director's Award (for project administration) and the NIDA Director's Award.